Medieval Hungary blog on break? No, the Medieval Hungary blog is not on a break. I've just been too busy to write things here during the last few weeks, but I have several posts in the making - including a review of the Europa Jagellonica exhibition, as well as book reviews and other news! Please keep checking back here - jekely.blogspot.com! 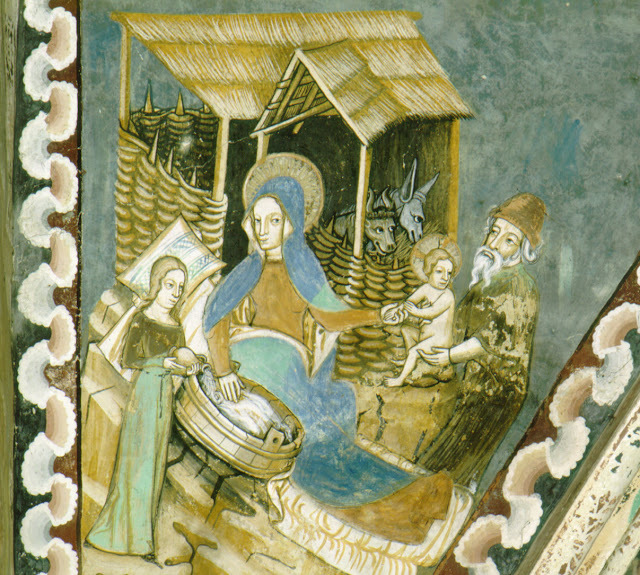 Merry Christmas from Medieval Hungary! Merry Christmas to all my readers! The photo above shows the Nativity fresco from the sanctuary vault of the church of Almakerék (Malmkrog/Mălâncrav), in Transylvania (present-day Romania), dating from around 1400. Befitting the holiday spirit, I am including two medieval Hungarian Christmas songs here, as performed by Anonymous 4. I am very proud to announce that my blog has been listed as one of the 50 best blogs for medieval history geeks. Whether my readers are geeks or not is not for me to say - it still feels good to be listed. My blog entries were also listed in the October 2010 issue of the Art History Carnival (edited by Margaret Lozano at The Earthly Paradise) and in the November 2010 issue of the Art History Carnival (edited by Monica Bowen at Alberti's Window). One of my posts was included in the 92nd History Carnival at The Early Modern Intelligencer of the Birbeck Early Modern Society. My blog is also mentioned in Vidimus, the only on-line magazine devoted to stained glass. I am grateful for all these mentions and listings. If you would like to stay up-to-date about this blog, you can follow it by clicking "follow" at the top of the page. Alternatively, you can follow my Twitter feed or follow my blog at NetworkedBlogs (where it is listed as one of the top 38 blogs in art history). Thanks for reading, and thanks for following and sharing.